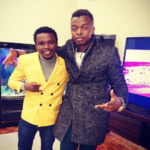 Comedian and host Chipukeezy has revealed that gospel singer Ringtone will check into a rehab soon. Speaking on his show on Ebru TV, the NACADA boss hosted Ringtone who has been trending for almost a year now for absolutely wrong reasons. Depression Ringtone started his cunning, and peculiar ways online when he first announced he wanted to marry Zari Hassan who was visiting Kenya. From there on it has been scandle after another for the singer as he posts videos and photos with wild accusations and captions. “Hey guys, Mr Ringtone has accepted to go to rehab,” he shared. Without sharing much, Chipukeezy said that the singer will go to rehab. Many believe the singer is depressed and and might also be using drugs. As of yesterday, Ringtone has invited guys to his house in Karen for a visit to see how he lives. The post Ringtone will go to rehab- Chipukeezy appeared first on Ghafla! Kenya.